Trying not to look down. The bridge in the photo above is one we have to walk over, very carefully, to get to the meditation space. We were there on Sunday for a little family devotion time and when we started walking back home, Leafy turned to me. “This bridge looks just like Golden Gate Bridge, except it’s smaller,” he said. 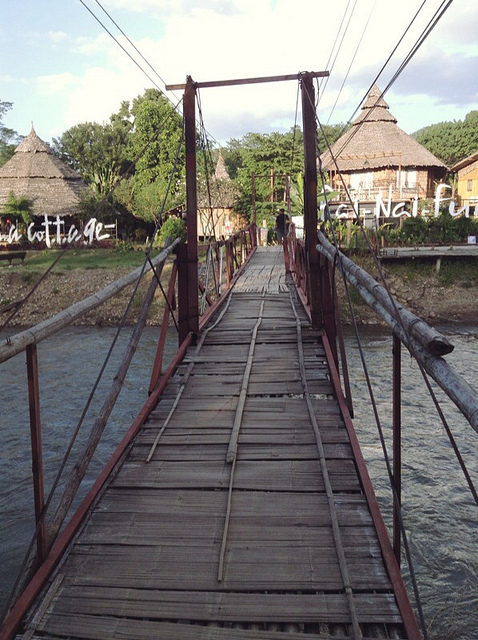 I’m heading into a month that feels a bit like walking across a very old, very rickety bridge. Chinua is going to the U.S. to share about what we’re doing here, to spread the word a bit and hopefully gather some interested hearts. We’d love to grow a little collective around Christian practice here. Actually, let me edit that: in order to move forward, we need to have other people working with us. We can’t do it by ourselves, and we don’t want to. We are used to living, working, singing, praying, and eating with others and we love it. So it’s necessary for Chinua to go back— sometimes you need to meet face to face with people, something we both know. That doesn’t mean it will be easy. When Chinua went to help take care of his friend Ian, Miriam was here with me. This time I’m on my own. Add to that the fact that due to weird circumstances, we’re having the most difficult financial month we’ve had in years, and I find that I’m a little nervous. I look across that bridge and shade my eyes, trying to see the other side. As I’m sure many of you know, when you have no leeway in your purse, there are no shortcuts. You make everything by hand, you cut out the extras. “Mandatory fasting, for you and me?” I asked Chinua when we looked at our numbers, only partially joking. I want to look at this with beautiful eyes. I’ve thought for a long time about living a monastic lifestyle as a mother, I know I’ve written about it. Monks and nuns volunteer for poverty and simplicity, they volunteer for work. Walking into a month where I know I will be stretched, I want to be monastic about it. To sing and pray, to be inordinately simple, to take frugality on like a robe. To walk under the same blue sky that we all walk under, whether we are rich or poor, leisurely or working hard. To be thankful, with every breath, for all that I have, for all the good work I do—the work of raising and teaching a family, of writing, of being surrounded by love. At the same time, I’m not flippant about this. Although my children are wonderful, I can’t count on them to be anything other than what they are: children. That means they aren’t consistent or self sufficient, they don’t need to offer me friendship. They are receivers. I’m working on a list of things I can do to take care of myself during this time, as well as help the family to live harmoniously together. It’s going to be a challenge, but it will be a good one. I'll be in the center of the bridge soon, stepping carefully, trying not to let it sway, listening to the rushing water underneath, and before you know it, I'll be on the other side, skipping off into the forest.